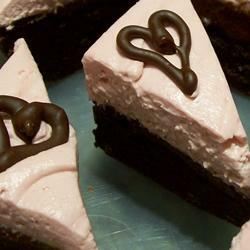 "These moist chocolate brownies are topped with a rich fudge layer and a fluffy raspberry cream cheese frosting. To make them even prettier, I like to garnish them with chocolate curls." Preheat an oven to 350 degrees F (175 degrees C). Line an 8 inch square baking pan with aluminum foil. In a large mixing bowl, beat the sugar, 2 whole eggs, and vanilla until combined. Mix in butter. In another bowl, combine the flour, cocoa powder, baking powder, and salt; stir into butter mixture, mixing just until incorporated. Fold in the chocolate chips. Pour the batter into the prepared pan. Bake in preheated oven until a toothpick inserted in the center comes out with moist crumbs attached, 25 to 30 minutes. Cool pan on wire rack. Whisk together the evaporated milk and egg yolk in a small saucepan. Heat over medium low, stirring constantly, until the mixture is very hot and thickens slightly; do not boil. Place the 4 ounces of chopped semisweet chocolate in a medium bowl, and slowly pour in the hot milk. Stir until the chocolate is melted and smooth. Pour the filling over the cooled brownies; refrigerate until firm, about 2 hours. Beat the cream cheese with the raspberry jam in a large bowl until smooth. Fold in the whipped topping, and add the food coloring if desired. Top the cooled brownies with the frosting, using a cake comb to create a design. Cut brownies into 16 squares, then cut each square in half diagonally to form triangles. Garnish with chocolate curls if desired.